This course's textbook: The Essential Cosmic Perspective (4th Edition) by Bennett, Donahue, Schneider, & Voit. To gain access to Mastering Astronomy, our textbook's wonderful on-line tutorial, go to the above webpages and click on our book. If you haven't registered with the on-line tutorial, then do so using the access code number printed in Mastering Astronomy packet, included with your textbook if you bought it new. First time users will be asked to register and to set a login name and password. If you bought your textbook used, and you want access to this optional yet valuable on-line tutorial, you'll have to purchase an access code on-line (click on "buy now") for $27. We have received tremendous positive feedback from students who have taken advantage of our book's on-line tutorial. If you bought your textbook new, you've already paid for the service, so why not check it out? If not, you might consider paying the extra little bit or working with a buddy who has access to the site. The Fall 2007 course syllabus is here. If you're not sure about the difference between astrology and astronomy, read this. The expectations of a teacher of introductory astronomy. Here are some tips for succeeding in an introductory astronomy course. Here is an amusing essay on how to fail an introductory astronomy course, written by my Ph.D. thesis advisor. 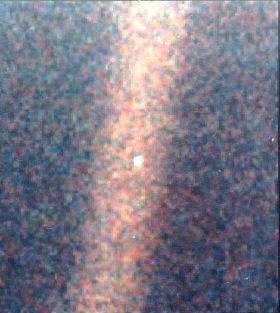 The white dot of light is Earth as photographed in 1990 by the Voyager 1 from more than 4 billion miles away (the band of light in the center of the image is due to scattered light in the camera due to the glare of the Sun, just off to the top). Read this very short essay, Reflections on a Mote of Dust, by Carl Sagan, and then think for a bit. Moving at a speed relative to the Sun of over 50,000 mph, Voyager 1 is now over 15 billion km (100 AU) away from home. 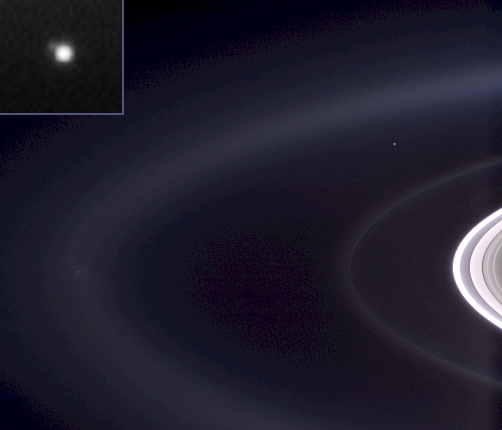 This pale, blue dot (a dot of light appearing above and to the left of Saturn's bright outer rings, with enlarged view inside upper left box) is the Earth (the Moon is seen as a 'bulge' on Earth) as observed from Saturn (it's outer ice rings seen here) by the Cassini orbiter, 1.4 billion km distant. In the cold, vast, empty void of space - that dot is all we've got. Poets say science takes away from the beauty of the stars - mere globs of gas atoms. Nothing is 'mere'. I too can see the stars on a desert night, and feel them. But do I see less or more? The vastness of the heavens stretches my imagination - stuck on this carousel my little eye can catch one-million-year-old light. A vast pattern - of which I am a part... What is the pattern or the meaning or the why? It does not do harm to the mystery to know a little more about it. For far more marvelous is the truth than any artists of the past imagined it. Why do the poets of the present not speak of it? What men are poets who can speak of Jupiter if he were a man, but if he is an immense spinning sphere of methane and ammonia must be silent? - Richard P. Feynman (1918-1988), Physics Nobel Laureate, from The Feynman Lectures on Physics, 1963. People may come along and argue philosophically that they like one better than another, but we have learned from much experience that all philosophical intuitions about what nature is going to do fail. - Richard P. Feynman, Physics Nobel Laureate. It seems to me that what’s at issue (at the end of the day) between serious investigators of the foundations of quantum mechanics and the producers of the “what the bleep” movies is very much of a piece with what was at issue between Galileo and the Vatican, and very much of a piece with what was at issue between Darwin and the Victorians. There is a deep and perennial and profoundly human impulse to approach the world with a DEMAND, to approach the world with a PRECONDITION, that what has got to turn out to lie at THE CENTER OF THE UNIVERSE, that what has got to turn out to lie at THE FOUNDATION OF ALL BEING, is some powerful and reassuring and accessible image of OURSELVES. That’s the impulse that the "What the Bleep" films seem to me to flatter and to endorse and (finally) to exploit - and that, more than any of their particular factual inaccuracies - is what bothers me about them. It is precisely the business of resisting that demand, it is precisely the business of approaching the world with open and authentic wonder, and with a sharp, cold eye, and singularly intent upon the truth, that’s called science. - David Alpert, physicist and philosopher of science at Columbia University. Do you know the difference between science and pseudoscience? If you don't, read this. Do "unlikely" events confuse you? Then read this and this. What's wrong with teaching "intelligent design" in the science classroom? and where's the science in ID? An example of how ignorance and lack of critical thinking skills can kill...read it! What's that, you say? Astrology is rubbish? And why should anybody care about Physics? How does it affect the life of the average person? Important. Don't expect me to provide you with a detailed review guide. That's your job. If something was mentioned in lecture, it's because I think it is important. Your reading assignments will reinforce your understanding of the material. On occasion some of the notes are provided as background information or for historical context (i.e., don't expect to be tested on this material). But if we discussed something at length, gave examples, and/or was highlighted in some way in the notes, you can bet that it's important enough to have a high probability of appearing on the exam. Read these tips on how to succeed in this course. Unit Exams will consist of approximately 45 multiple choice questions and last 50 minutes (closed-book, closed-notebook, closed-laptop, ...). Bring a couple of #2 pencils and an eraser. You will also need to know your class 5-digit number that you chose during the first week of class (I sent an email of solicitation - here are the instructions for choosing your number if you DID NOT receive that email or otherwise have not chosen a 5-digit number). Finally, bring also your notebook - lecture will commence right after the exam. It is the policy of this department that all exams are timed - there will be no open-ended exams. No calculator will be necessary or allowed - only very simple proportions will be presented (I assume you can determine quantities like 100 / 10 or 3 x 3 in your head). ALL equations that I present in class relevant to the unit exam will be provided on the front page of the exam. Do not memorize equations. Rather, know and understand the concepts they represent, how these concepts are related to one another, and what these relationships tell us about the cosmos. Understanding interconnected concepts means you recognize their connections and know how to apply them. That means that if a question appears to you to require a calculator to answer, you either didn't read the question and answers carefully, or you are lost. Taking simple proportions or making comparisons between numerical values is all that is required mathematically on the exams. You may also be required to understand the relationship(s) appearing on a simple graph. Exam results are posted in the back of the lecture room, the answers on the projection screen, and your exam booklets made available on the first (usually) class meeting after the exam. After that, you will need to meet with me to get these things. If you don't get the results you desired on the first exam, keep this quote from Albert Einstein in mind: Insanity is doing the same thing over and over again, and expecting different results. Unit 1 Introduction and Tools of Astronomy Reading Assignment: Become familiar with the existence of Appendices A (a list physical and astronomical constants) and B (a summary of many of the equations used in text). If you think your math skills and metric units knowledge might be rusty, then definitely read Appendix C (math and units review - especially C.5 Finding a Ratio). Chapter 1 (all - it introduces the key concepts of the "astronomical unit" and "light year", describes our place in cosmic space and time, and paints a broad overview of what's to come); Ch. 2 (just two small sections: Section 2.1 through "Constellations", and "Angular Sizes and Distances"); the short discussion of "The Magnitude System" on pp. 304-305; Ch. 3 (3.1 to middle of p. 56, then section 3.4, and finally section 3.3 with special emphasis on "Kepler's Laws" of planetary motion); Ch. 4 (through "Escape Velocity" on pp. 97-98); Figure 6.26 on p.170 (and the accompanying text), and Chapter 5 (section 5.1 through "The Many Forms of Light", and section 5.3). These readings constitute Unit 1and you are responsible for this material plus what we cover in lecture. Here are several sample exam questions for possible extra credit on Exam 1. Deadline: by or before beginning of class of TBA. Here are links to supplementary notes for this unit. I highly recommend them! Did you also have a look at the recommended articles in the Universal Inquirer section (below) relevant to this unit? Exam 1 covering the material of Unit 1: TBA. Unit 2 Light, Matter, and the Observed Properties of Stars Reading Assignment: review the subsection "Thermal Energy" on pp. 91-92 in Chapter 4, Chapter 5 (section 5.1 beginning with "What is Matter? ", and section 5.2; pp.122-123 provide a nice summary of how we interpret light spectra), page 142 ("The Sun" in Chapter 6), Chapter 10 (in 10.1: "What's the Sun's structure" up to and including "The Sun's Atmosphere" on pp. 281-282, and section 10.3: "The Sun-Earth Connection" up to and including "The Sunspot Cycle" on pp. 293-294), and Chapter 11 (sections 11.1 and 11.2 only). These readings constitute Unit 2 and you are responsible for this material plus what we cover in lecture. Here are several sample exam questions for possible extra credit on Exam 2. Deadline: by or before beginning of class of TBA. Review Session for Exam 2: TBA, in 1104 Rood Hall. Exam 2 covering material of Unit 2: TBA. Unit 3 Stars: How They Work and Their Life Stories Reading Assignment: Chapter 10 (all of sections 10.1 and 10.2), Chapter 11 (11.2 - review all, but especially the discussions of "Masses of Main-Sequence stars" and "Stellar Lifespans"), Chapter 12 (all except "How are the lives of stars with close companions different?" in 12.4), Table 14.1 on p.390 (in connection to the discussion of star formation in 12.1), Section 11.3 of Chapter 11, and Chapter 13 (13.1 up to the top of p. 357, 13.2 - just "What is a neutron star? ", and 13.3 to the middle of p. 365). Finally, pp. 346-347 and 376-377 provide some excellent summaries on the workings and evolution of stars. These readings constitute Unit 3 and you are responsible for this material plus what we cover in lecture. Also, you may want to look at the recommended articles in the Universal Inquirer section (below) relevant to this unit. I have also written a highly recommended overview of how main sequence stars work and an overview of why stars evolve as they age, and eventually die. Here are several sample exam questions for possible extra credit on Exam 3. Deadline: TBA. Review Session for Exam 3: TBA, in 1104 Rood Hall. Exam 3 covering material in Unit 3: TBA. Unit 4 Galaxies & Cosmology Reading Assignment: Chapter 14 (14.1, 14.2: skim to p. 391, then read pp. 392-394, and 14.3), Chapter 15 (15.1, 15.2, 15.3), Chapter 16 (16.1, 16.2 through p. 443 and then skim rest of this section, plus 16.3), Chapter 17 (17.1, 17.2 and 17.4). Note: the word "skim" does not mean "skip". A nice summary of the evolution of structure in the universe is provided on pp. 492-493. These readings constitute Unit 4 and you are responsible for this material plus what we cover in lecture. Roughly 45 questions on the Final exam will cover Unit 4. Here are several sample exam questions concerning Unit 4 for possible extra credit on the Final Exam, due at the start of class on TBA. Here is an overview of the important properties of galaxies (for this class) - and more importantly - discussions of how they became the galaxies we observe today. Whatever else you read about galaxies, I'd read this review. There isn't any material presented there which isn't also in your notes, but the more important big ideas are tied together. This is a listing of the big ideas concerning the topic of cosmology in Unit 4. Exams 1 + 2 + 3 Results posted here. Student number, raw exam scores (scored from 45), extra credit (out of a possible +5%); "curve" for each is listed at the top. Review session for Final Exam: TBA, in 1104 Rood Hall. Final Exam (about 100 questions, comprehensive, i.e., it covers all 4 units): TBA. Bring a couple of #2 pencils and an eraser. As on the unit exams, no calculator will be necessary or allowed. "...the total number of stars in the [observable] universe is greater than all the grains of sand on all the beaches of the planet Earth." Can this be so? Recommended: understanding Kepler's 3 laws of planetary (orbital) motion with minimum mathematics. You've probably wondered about... weight, weightlessness, and gravity. Recommended: a discussion of light, color perception, and thermal (blackbody) radiators. Thought provoking: a comment upon so-called "limits to human knowledge." Recommended: how do we know how stars work? Recommended: how do computer models of stars work and what do they tell us? You may have wondered about...ages of the Earth & universe; more here and here specifically discussing radiometric dating; evidence of age from MANY different directions; and consider this....And here is a site discussing the Determining Distances to Astronomical Objects. Finally, here is a web site discussing the many independent, converging lines of evidence for the ages of the solar system, stars, galaxies, and the cosmos. Recommended: If the expanding universe has you in a tizzy, try this page of FAQs and this very informative page demonstrating how light travels in expanding space-time. Thought provoking: evidence for an evolving universe: why is the night sky dark? or is it...? 1And students with inquiring minds generally earn higher scores on the exams...The "Recommended" articles might prove helpful toward improving your overall understanding in this class. The other articles discuss topics related to those in class, but are provided only for the very curious. The following set of links contain information on topics related to but beyond the content of this course. Nevertheless, some of you may find them interesting. Free Public Telescopic Observing Sessions of the night sky for 2007 at the Kalamazoo Nature Center (usually beginning after twilight, if skies are clear; here is a map), sponsored by the Kalamazoo Astronomical Society (KAS). I am a member and often go to these events. Here is the scheduled list of events. For all observing sessions: dress appropriately; events are outdoors, and there are no restroom facilities. The KAS will supply the telescopes; all you need is a pair of eyes. However, if you have binoculars or your own telescope, feel free to bring it out. KAS members will also be happy to help you use your telescope. The new sciences of astrobiology and astrochemistry - finding life's building blocks in the cosmos. An editorial from the Kalamazoo Gazette, March 12, 1998, illustrating a common misunderstanding of how science works (and a poor understanding of cosmology), and here is my response to that editorial, Viewpoint March 25, 1998. Some really cool JAVA animation demos in astronomy concepts are here & here. Another really nice set of computer simulations illustrating the concept of an expanding universe and cosmological redshift (towards the bottom). This is the best part of the class web pages. While I'll be showing many of these in class, you should feel free to browse them on your own. You may find them both useful and wonderful, and they are found here.